The following information comes from the Operator's Manual for the John Deere Model B tractor. If you'd like to get a manual of your own, just back up to the "Tips" page and click the link that says "WHERE TO GET MANUALS FOR YOUR TRACTOR". All of the manuals are still available from John Deere. Next, secure a short piece of wire and insert one end in the upper terminal of the distributer cap on the magneto, bend the other end around to within 1/8-inch of some metal part on the magneto frame. Hold the magneto solidly in the same upright position as when mounted on the tractor. Grip the driving lug on the impulse coupling firmly and turn the impulse slowly in a left-hand direction (counter-clockwise). Stop instantly when impulse trips and spark occurs between end of wire and magneto frame. When impulse trips, driving lugs on the impulse coupling will be in a horizontal position. Replace magneto and gasket on the governor case, making sure the impulse coupling lugs engage slots on the governor drive coupling. A gasket must be used between bolting flanges. After tightening the two cap screws firmly with the fingers, rotate the top of magneto toward front of tractor as far as possible. 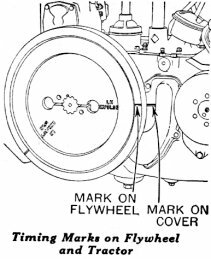 Then rotate the flywheel one complete turn and line the flywheel mark "L. H. Impulse" exactly with the timing mark on the tractor. Now tap the top of the magneto toward the rear of the tractor a little at a time until the impulse trips. Tighten cap screw holding magneto to governer case and install spark plug cables. 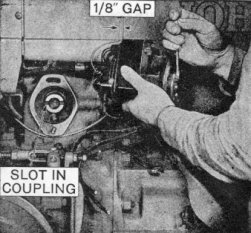 Left-hand spark plug cable must be installed in upper distributor cap terminal. The preceeding instructions apply to model B's with an exposed flywheel from serial number 1000 to serial number 200999. Tractors with serial numbers 201000 and higher have a starter and a completely shielded flywheel. Remove the center portion of the guard and follow the same basic procedure as outlined above, except that the timing marks are a punch mark on the flywheel hub and a "V" groove on the main portion of the guard at the "6 o'clock" position.